Do you have a project that calls for the installation of tiles? Then it goes without saying that a tile cutter is among the tools that you need to have in order to achieve the best results. This tool will help you cut tiles into its recommended sizes and shapes to make sure you will be able to deliver the best installation results. If you are planning to buy a tile cutter, you have to be certain that you are buying the right tile cutter. Buying the wrong tool will only be a waste of money and poor results, what’s even worse is that you might end up with broken tiles and a lot of energy wasted. 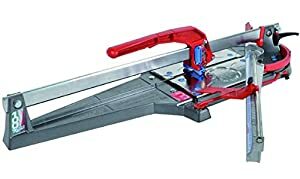 So for today’s article, I will be sharing with you the best tile cutter available in the market. Please keep on reading below to know what products made it to the list. If you are looking for a manual tile cutter that can give you a tough all-around performance, then look no further. QEP 10900Q 35-Inch Manual Tile Cutter is one of the best in the market. It’s quite popular among DIY enthusiasts and contractors for a lot of good reasons. First of all, this tile cutter really brings precision and quality to the table. It features a Score and Snap procedure to split the tiles. There’s no need to put too much downward pressure whenever you are cutting tiles, all you have to do is to roll the blade over the tile. It also comes with a straight edge adjustable measurement guide that will take care of accuracy. In addition to that, it features a 7/8-inch titanium coated tungsten-carbide cutting wheel to give you a much smoother and hassle-free cut, while a high-leverage bicycle grip handle makes it convenient to use. The cutting power of this tool is ideal for cutting ceramic and porcelain tiles. With regard to diagonal cuts, this tile cutter can rip up to 35 and 24 inches, if diagonal. This means it is capable of cutting any standard tile sizes, something that you will definitely need for various projects. Another thing I like about this tool is that it is not only easy to operate but easy to maintain as well. You can easily clean it using regular soap and water or with compressed air after you are done working with it. It also has a pretty wide alloy base that makes this tool stable enough. Plus, there are also rubber pads that prevent the tile cutter from sliding whenever you are working. Here’s another remarkable tile cutter that will give you the precision and time efficiency that we’ve been all yearning for. This tool will allow you to cut tiles up to 47 inches and you can cut up to 6 inches thick. But what makes it amazing is that it is fitted with an adjustable laser guide that reduces the risk of making cuts that are not parallel to the edge of the tile. It’s easy and fun to use this tile cutter. Its handle comes with a comfortable grip that provides ample stability as well as control over a smooth tile-cutting slide. It’s also pretty quick and simple to line the tile up and cut through the tile’s entire length; as a result, you will get a much more accurate cut. The steel side rails will guide your tiles when scoring too. On top of it all, the alloy wheel cutter, ball bearing as well as the steel rail are made from high-quality materials that make it possible to cut through almost every type of tile. So if you are planning to buy the best manual tile cutter, this Mophorn Tile Cutter can be your best bet. It can be used on various applications; in addition to cutting floor tiles, ceramic and porcelain tiles, you can also use this in cutting stone, vitrified tiles and polished tiles. This model from Montolit Masterpiuma is the best choice for professionals who want precision and accuracy. 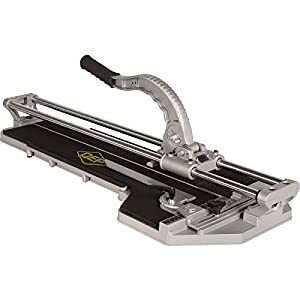 This manual tile cutter is primarily intended for the professional market, so it is undoubtedly the most costly among the product on this list because of its quality. I know the price may probably put you off, but this is the best quality manual tile cutter you can purchase. This tile cutter is intended to cut porcelain, ceramic and glass. It can handle any tile cutting job with ease, whatever the thickness or thinness of the tile you are working on or what the material is. It features a tungsten carbide cutting wheel that cuts flawlessly. A multi-point break system has also been incorporated with this tile cutter for more accurate, consistently cleaner breaks after each tile are scored with the cutting wheel. This means you will less likely loose tiles when cutting due to incomplete or imprecise cuts. It is made of nickel-plated steel and die-cast aluminum to make sure it will not be damaged quickly or will not be prone to corrosion. In addition to that, it has integrated lubrication that you can use to restore movement whenever you need it. Its handle has also been ergonomically designed, and even comes with a protractor square to make sure your measurements are accurate. Here’s another professional tile cutter that features 7/8-inch cutting wheel for precision. The reason why this tile cutter made on top of my list is that it has a solid construction as well as remarkable features and capabilities that made it user-friendly. This tool has the ability to rip cut tile of 20 inches and 27 inches diagonally. It comes with wide die-cast aluminum alloy base to make it stable even if you are cutting large-sized titles. I was pretty impressed by how the tool's side arm extension can hole extremely large tiles. It also has four heavy-duty rubber pads so it will not budge from its position and allow you to cut tile more accurately. 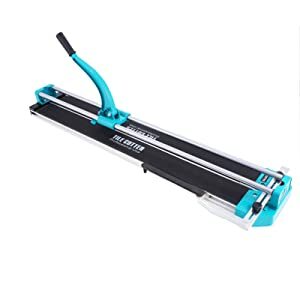 In addition to that, this tile cutter comes with titanium coated carbide wheel which makes it easier to score and break hard tiles using only a minimum downward pressure. The titanium coat makes the carbide wheel sturdy enough for long term use. But what’s even great is that you can work on with this tile cutter for long period of hours without feeling any back pains or fatigue on your shoulders. It also comes with three chrome-plated rail bars and ball bearings so it will not be difficult to move the tool. No wonder why it has been highly recommended by most DIY homeowners. When it comes to performance, this electric tile cutter is the best. It has cutting power that can go through a wide range of materials. This is because it has been built using solid materials like an extruded aluminum foundation. Its surface is made of plastic to make sure it will not wobble. In addition to that, this cutter comes with an adjustable handle to provide you with the force needed for cutting; this makes it comfortable to cut. This cutter also comes with a guide that will lock and swivel, which is important for a more precise angle cuts. I like that this guide can be easily adjusted and will help you maintain square cuts. Its 13 inches blade is sharp and built for heavy-duty use; when it gets worn-out, you can just quickly replace it. With thousands of tile cutters on the market, finding the best among the sea of options can be a real struggle. But you should always go for the best. So I’ve listed down below the most important factors you have to consider when buying for a tile cutter. Keep on reading below. You have to be very certain about the type of tile cutter you will buy to make sure it will be able to serve the purpose it is intended. Your decision will likely depend on the type of task ahead of you. The most common types of tile cutters are manual tile cutter and electrical tile cutter; each has its own advantages and disadvantages. Manual Tile Cutters: These are simple tools that come with a scoring wheel and a durable base. They are designed to cut different types of tiles, easily and quickly. Most of these units are lightweight, portable and compact. However, since manual cutting tiles can be a bit tiring, they are more appropriate for simpler and lighter-duty jobs. 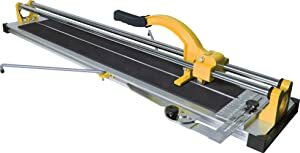 Electric Tile Cutters: These are also often referred to as tile saws. They come in various sizes and styles and are the must-haves of professionals working on heavy-duty tasks. This is because they can cut much better and faster through thick tiles made of tough materials. They are recommended for high-volume demands; however, they are difficult to transport from one job site to another. Think about the type of tiles you are going to cut. Take note that tiles vary in thickness and texture. So make sure you are choosing a cutter that is can accommodate compatible blades and comes with enough power to cut through. Most of the regular ceramic tiles, which are the most commonly used at home, can be cut through with most types of tile cutters. Cutters are available in different sizes. The most common ones are 14 inches, 24 inches and 35 inches. Make sure you are buying the right sized cutter according to the size of the tiles you often cut. Is your choice of tile cutter remains in place whenever you are cutting several large and thick tiles? Make sure that the tile cutter will be stable enough or else you might ruin the outcome of the tiles. Check out if the cutter features a reinforced base that will not slide of its place when in use. If you need to use a tile cutter in different worksites, then portability is an important factor you need to consider. A cutter that is compact and lightweight will always be your best option. Installing new shiny ceramic tiles is definitely a daunting task, especially if you don't have the right tools. 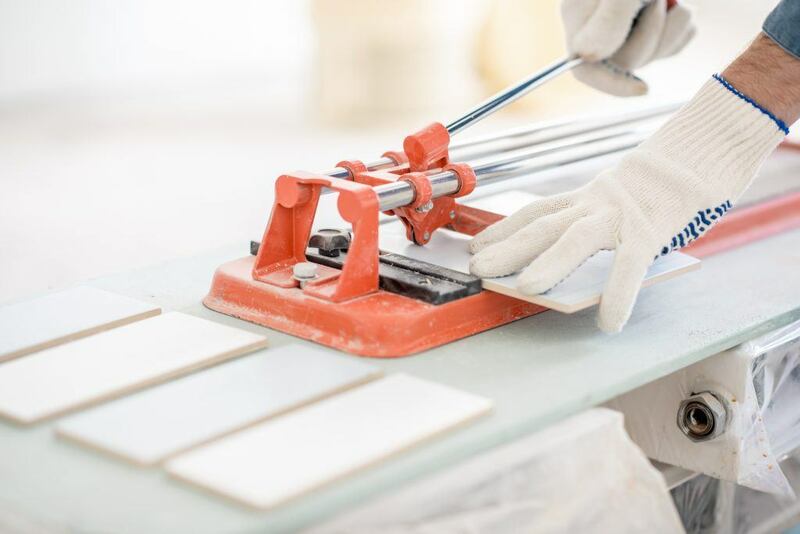 Whether this is just your first time cutting tiles or you are already a seasoned DIYer who has done this before, the best tile cutter will make the entire process easy. You will be able to complete any type of tiling project in no time. So hopefully, you will be able to choose from the products I mentioned above that will suit your needs and preference. If you still have any more question, don’t hesitate to drop it in the comment section below. I’ll get back to you as soon as I can.